http://www.filmfestnih.org/) at Grosvenor in August, so it’s unlikely that they’d step in. PEPCO should do it, they could really push all kinds of “green” marketing along with it, especially because it’s an issue that’s important to everyone nowadays. Love it. 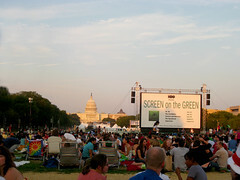 I would like to allocate the $400 a month Pepco robs from me to go towards a sponsorship of Screen on the Green. Pepco’s pretty brilliant for a local sponsor. Pepco are you listening? Smithsonian gets beat up too much about their spending to take on something like this, dontcha think?